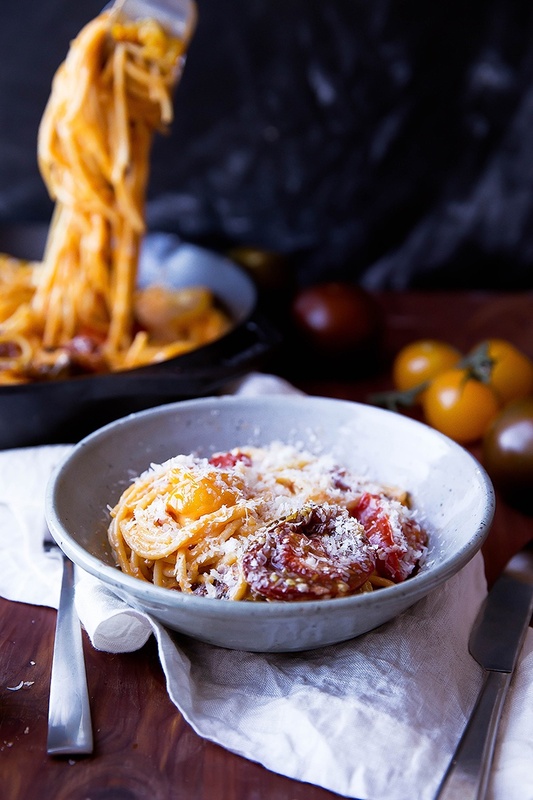 From week night to date night, this spaghetti with white wine & roasted tomato cream sauce from Broma Bakery is sure to please! My boyfriend got me hooked on pasta. Growing up, I was not a huge fan. I would much rather have bread or gnocchi or rice. Pasta? Not so much. It was too plain, too boring, too meh. But after living together for 3 years, it was hard not to like pasta. 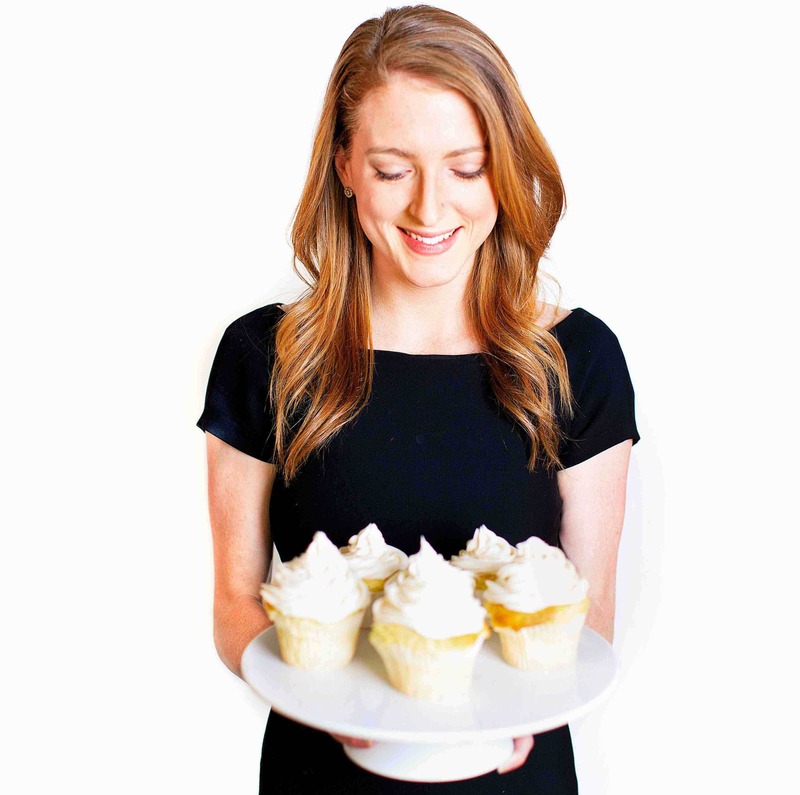 As a college athlete, Alex’s ideal meal was one that involved carb-o-loading. At first, I let him eat his pasta while I made myself something else. But as the years went on, more and more I would join him in pasta dinners. Plus, he makes a killer pasta stir fry that I request monthly (ok, sometimes weekly). Now that we live apart, I still find myself reaching for pasta when dinner time comes around. 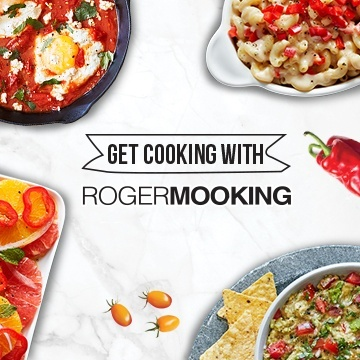 There’s so many ways to cook with it, the possibilities are endless. Clearly, that boy got me hooked. 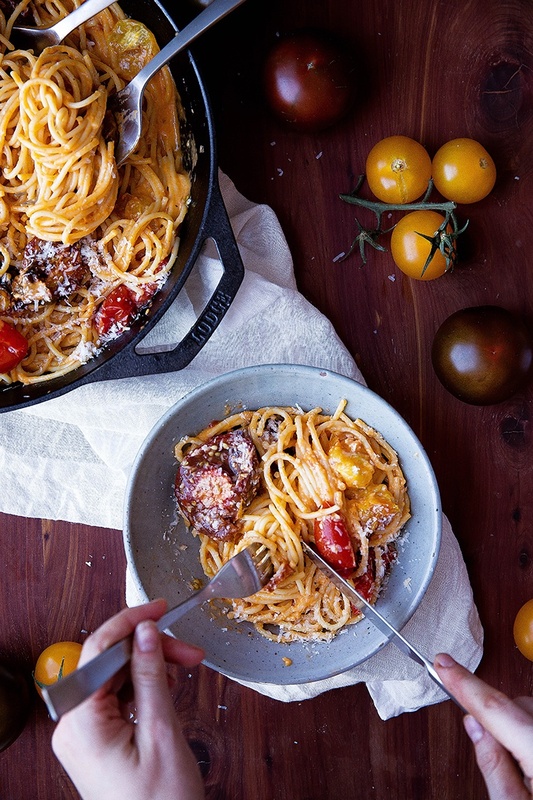 One key to making a great pasta is fresh tomatoes. The canned stuff just doesn’t compare. So when SUNSET® asked me to make a recipe using their tomatoes, I knew exactly what to do. SUNSET® is a produce company that specializes in seriously fresh fruits & vegetables. 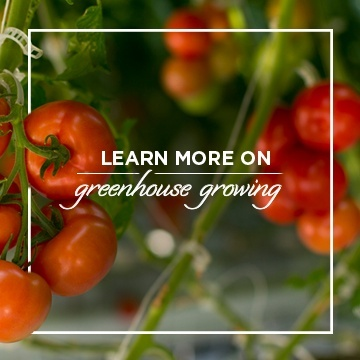 As the first commercial greenhouse growers in North America over 60 years ago, they quite literally pioneered the greenhouse industry as we know it. Now, they sell a variety of tomatoes, peppers, and cucumbers all over the continent. SUNSET® sets the bar high in the world of produce. They grow their tomatoes in organic coconut husks and rockwool. SUNSET® strictly uses recycled water, and they are totally pesticide-free. And their packaging is made from corn and recycled soda bottles. All this ranting is totally on me, by the way. I just get so excited when I hear about bigger companies using sustainable practices. I think it’s absolutely amazing that a multi-national brand can be successful and sustainable. It’s something that I care deeply about, and that is so important in creating a positive future for our world. Campari®, also called The Tomato Lover’s Tomato®, is a fat and juicy cherub of a tomato. It’s slightly sweet and perfectly acidic, and can be used in nearly any recipe calling for tomatoes. Its versatility lends itself perfectly to this white wine cream sauce. Kumato was recently named the best tomato for men, according to Men’s Health Magazine. Its dark, rich color is accompanied by a hearty, perfectly-sized tomato that stacks beautifully with luscious slices of mozzarella. If Y.E.L.O. (Youth, Energy, Life, Om)® were a person, they’d live in California, do yoga, and own a dog named Bailey. They pack in 50% more Vitamin C than their larger tomato counterparts, and add brightness to any dish. They also roast up gorgeously (just look below)! 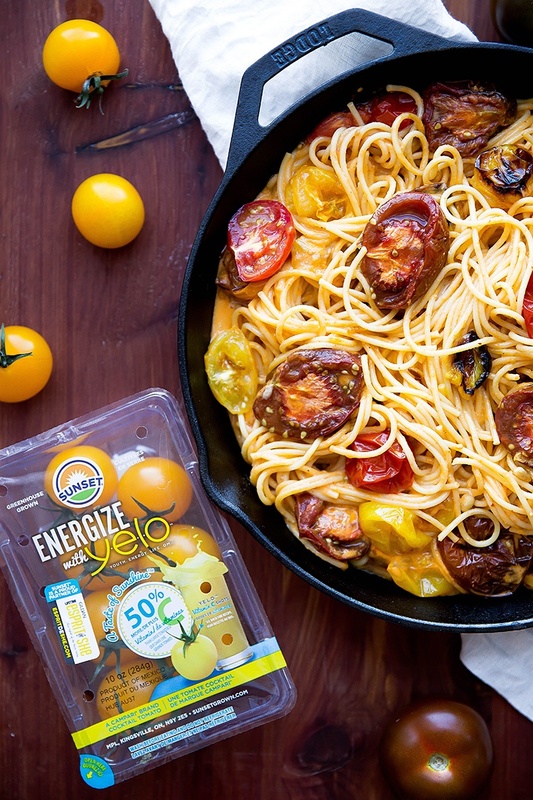 SUNSET® tomatoes are available at most grocery stores around the country. Next time you’re in the produce section, I highly recommend you pick up a few! Slice tomatoes in half, then place on a large baking sheet. Brush each one with olive oil, then sprinkle with salt. Roast for 30 minutes, until the tomatoes are wilted and soft. Remove from heat and allow to cool. In a large pan over medium heat, sauté the onions in a splash of olive oil until translucent, about 5 minutes. Add in the garlic and cook for another 1-2 minutes. Sprinkle the flour over the onions & garlic and stir everything together. The flour should form a pasted coating on the onions. Cook for 1 minute, then whisk in the white wine, milk, cream, and salt. Whisk any flour beads until they no longer remain and the sauce is thick and velvety. Turn heat to low and continue to cook, uncovered, for 15 minutes, stirring occasionally. Meanwhile, boil the pasta and cook to al dente. 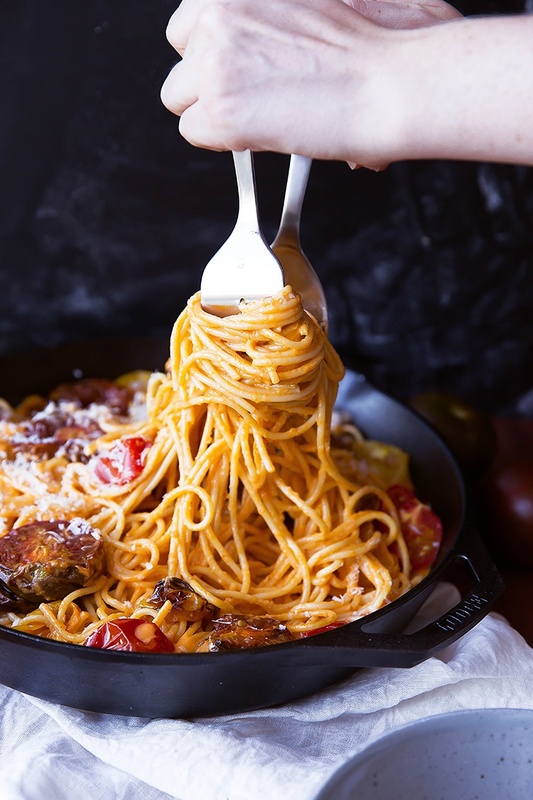 Strain the cooked pasta and place back into its pot and drizzle with ~1 tablespoon of oil. This will keep the pasta from sticking to itself. 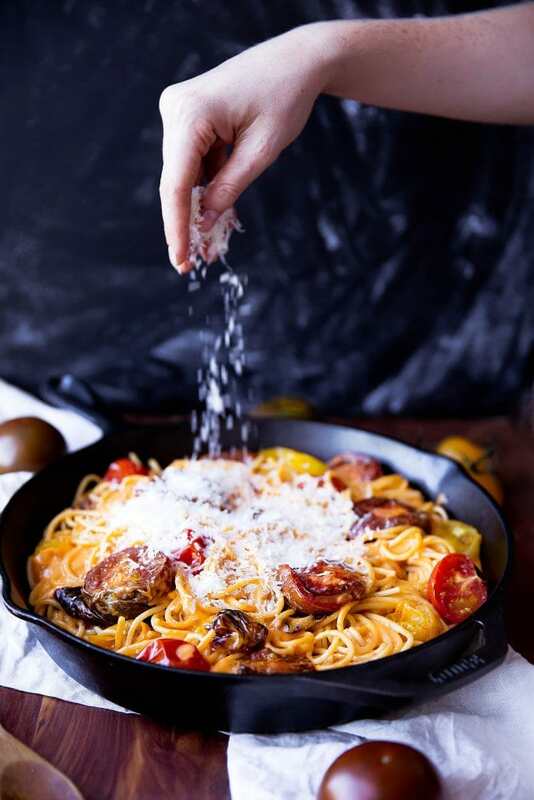 Once the cream sauce has thickened, pour it into a large blender and toss in the Campari® tomatoes. Blend on high speed for 3 minutes, then strain the sauce over a fine mesh sieve to remove any remaining pieces of tomato. Pour the strained sauce over the pasta and stir to combine. 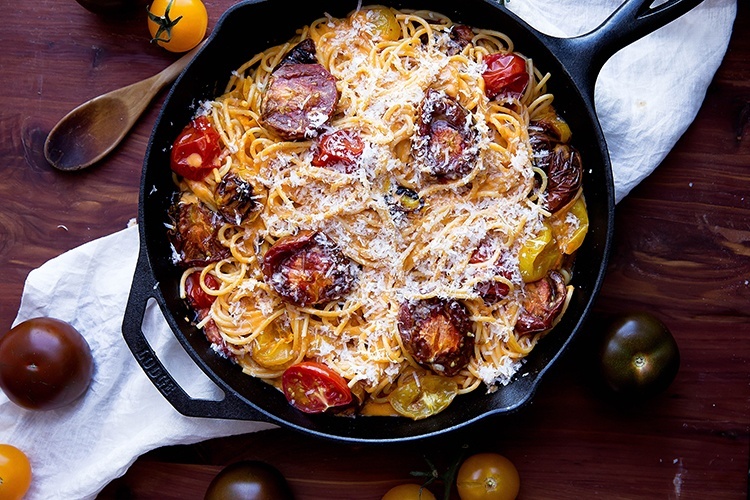 Top with the Kumato & Y.E.L.O.® tomatoes, then garnish with a healthy dose of parmesan!